QuickBooks was probably great in the beginning, helping to get your business off the ground. See for yourself! 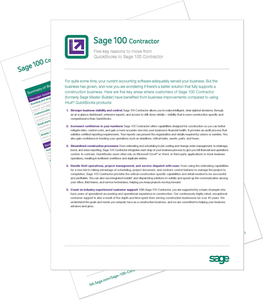 Grab a copy of this valuable guide that provides a detailed, side-by-side comparison of the benefits and capabilities of Sage 100 Contractor vs QuickBooks. Leave your name below and we’ll send you the Sage vs. QuickBooks feature comparison.